Global equities are better bid in the overnight session on renewed optimism that China and the US would reach a deal as trade talks resume in Washington. According to a FT report today, the world's two largest economies are "still at odds on carrying out and enforcing a deal, while most other roadblocks were cleared." Investor sentiment has also improved on a better-than-forecast increase in a gauge of China's services industries and on stronger Aussie retail sales data in the overnight session. Sterling (£1.3175) has rallied for a third consecutive session as PM Theresa May announced a cross-party approach to break the impasse in parliament over Brexit. Yesterday she indicated she would look for Labour support for a new Brexit deal. However, there is no guarantee that Labour and the PM would agree terms on the Brexit path, nevertheless, the fact that she is willing to cross the floor is a clear shift in her party's stance towards a 'softer' Brexit. PM May still insists that her withdrawal agreement - which was voted down last week - would remain part of the deal. The UK requires an extension and PM May has said she wanted the extension to be "as short as possible" - before 22 May so the UK does not have to take part in European elections. On tap: US services and ISM non-manufacturing PMI (09:45 am EDT), Reserve Bank of India (RBI) will set policy tomorrow, and Friday's NFP is expected to show a headline print of +180k for March after February's miss, while Canadian employment may show a revision after their massive headline print. China's Vice Premier Liu He is in Washington to resume trade negotiations with his US counterparts. In Japan, equities rallied overnight on renewed optimism over Sino-US trade talks which lifted shippers and other cyclical shares while index heavyweight Fast Retailing Co. soared after it reported strong monthly sales. The Nikkei share average rose +0.97%, edging closer to its best level for 2019. The broader Topix advanced +0.63%. Down-under, Aussie shares closed at a new seven-month high overnight as soaring iron ore prices boosted miners, while healthcare stocks surged after Australia's government allocated record spending for the sector in its pre-poll budget. The S&P/ASX 200 index rallied +0.68% at the close of trade. The benchmark rose +0.4% on Tuesday. In S. Korea, the Kospi index has rallied +1.2% on reports that the US and China are drawing closer to a final trade agreement. In China, stocks closed at their highest levels in 12-months overnight, aided by further evidence of economic recovery and signs of progress in trade talks. The blue-chip CSI300 index rose +1.3%, while the Shanghai Composite Index closed up +1.2%. While in Hong Kong, stocks traded atop of their 10-month highs. The Hang Seng index rose +1.2%, while the China Enterprises Index gained +1.4%, its highest close since June 2018. In Europe, regional bourses trade mainly higher across the board with the DAX outperforming, tracking stronger indices in Asia on upbeat service PMI data out of Europe and Asia. US stocks are set to open in the 'black' (+0.49%). 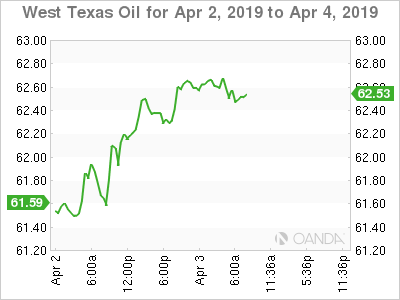 Oil prices have rallied for a fourth consecutive session, pushing Brent toward its five-month high as support from OPEC+ led supply cuts and US sanctions overshadow Tuesday's report stateside showing an unexpected rise in US stocks. Brent futures have gained +38c, or +0.55%, to +$69.75. They earlier reached +$69.96 - the highest since Nov. 12, when they last traded above $70. While US West Texas Intermediate (WTI) crude rose +20c or +0.32% to +$62.78, having hit +$62.99, the highest since Nov. 7. Oil prices have been supported for much of this year by efforts from OPEC+, who have pledged to withhold around +1.2M bpd of supply this year. Last month saw supply hit a new four-year low - OPEC crude oil production is expected to average +30.1M bpd in 2019, down from +31.9M bpd in 2018. Note: According to the API yesterday, US crude stocks rose unexpectedly last week, while gas and distillate inventories declined. Expect dealers to take direction from today's EIA report (10:30 am EDT). 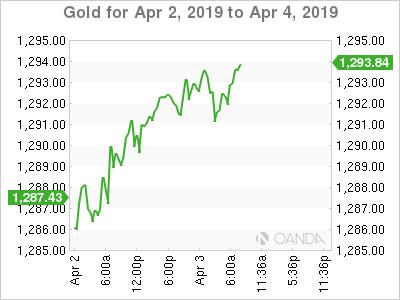 Ahead of the US open, gold prices edged lower as safe-haven demand for the 'yellow' metal subsides with equities rallying to a seven-month high, while a weaker dollar limits the metals losses. Spot gold is -0.2% lower at +$1,290.81 per ounce, while US gold futures are flat at +$1,295.50 an ounce. The 10-year German Bund yield trades about +2 bps lower at -0.01%, while the 10-year Italian BTP yield trades about +7 bps lower at +2.55%. On Tuesday, the ECB said it interest rates would stay at current levels at least through the end of 2019, having previously said until after the summer. It will introduce new quarterly TLTRO-s in September, ending them in March 2021, each one with two-years of maturity. Elsewhere, the yield on 10-year Treasuries has backed up +4 bps to +2.52%, while the yield on two-year Treasuries has rallied +3 bps to +2.33%. Sterling (£1.3175) is holding onto this week's gains, shrugging off a weaker-than-expected UK services PMI (see below). 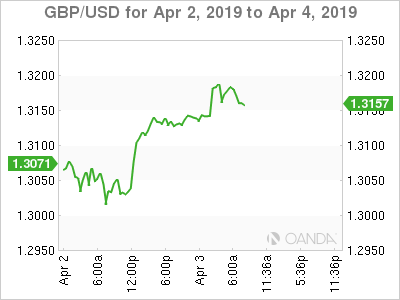 The pound remains driven by Brexit developments and remains in firm territory after PM May said yesterday that she would look for cross-party support for a new Brexit deal. 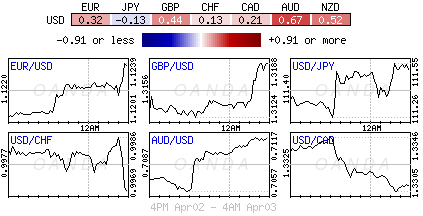 GBP/USD is last up +0.3% at £1.3177, slightly stronger than around £1.3162 before the data was released. EUR/GBP is flat at €0.8533. 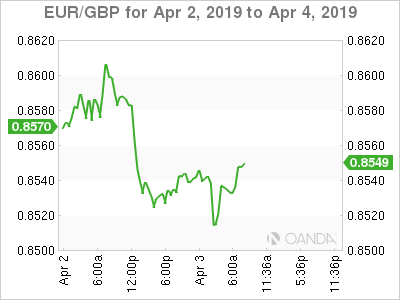 The risk for the pound is that hard-Brexiteers (without a deal) within the Conservative party strongly oppose PM May's decision to seek a Brexit compromise with the opposition Labour party. What will be their response? Lack of unity in parliament is the key reason why the U.K. has so far failed to endorse a Brexit deal with the EU. Elsewhere, a pick-up in risk appetite is providing some headwinds for the recent USD strength, nevertheless, investors continue to favor the USD as EUR/USD stays around €1.1240, having fallen yesterday (€1.1181) to its lowest since the March ECB meeting. But the appetite for the 'big' dollar is more the result of safe-haven demand rather than fundamentals. Rate differentials between the two currency pairs have tightened since last month, which should indicate more EUR support on pullbacks. EUR/USD is last up +0.2% at €1.1242. Data this morning showed that Brexit worries has caused the dominant services sector to contract for the first time in nearly three years. The IHS Markit/CIPS services Purchasing Managers' Index (PMI) tumbled to 48.9 in March from 51.3 in February, much weaker than the expected forecasts of 51. This index sits firmly in contractionary territory for the first time since July 2016, immediately after the UK voted to leave the E.U. Note: A broader PMI (manufacturing and construction) data released this week, also fell to its lowest in 36-months and escaped outright contraction only because firms bought more raw materials to prepare for a potentially disorderly Brexit. "A stalling of the economy in the first quarter will … likely turn into a downturn in the second quarter unless demand revives suddenly, which given the recent escalation of Brexit uncertainty, seems highly improbable," IHS Markit said.